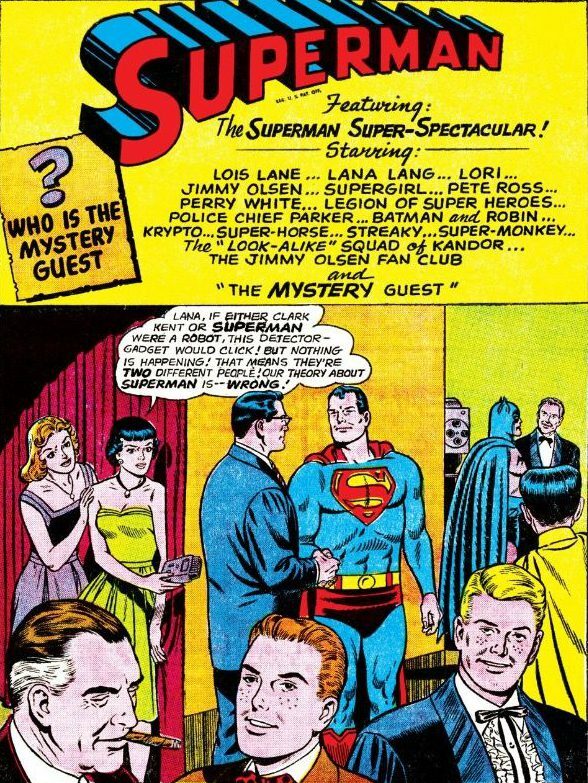 It is not a party until the Jimmy Olsen Fan Club arrives. In “The Superman Super-Spectacular,” written by Edmond Hamilton and illustrated by Curt Swan and appearing in “Action Comics” No. 309, the Last Son of Krypton is tricked into appearing on the premiere episode of “Our American Heroes” – imagine “This is Your Life,” only with a flying horse. 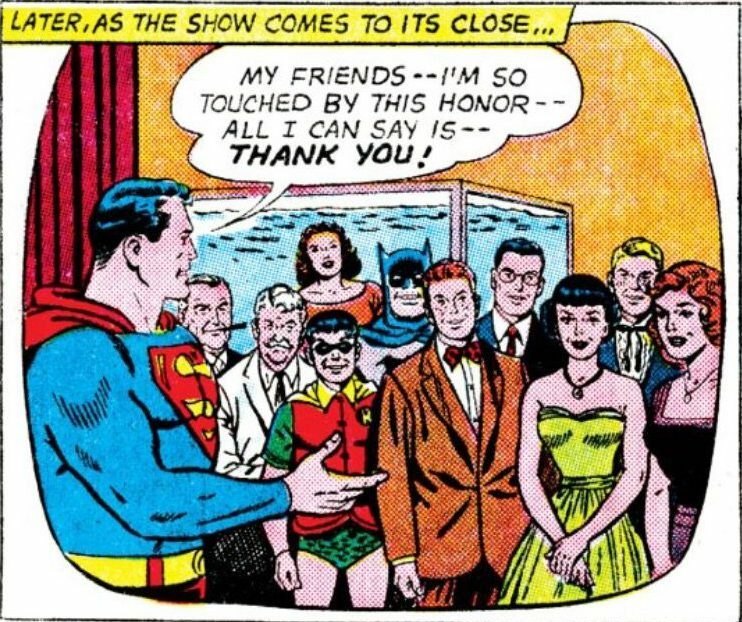 That’s right, everyone from Superman’s life – from the staff of the Daily Planet to BFF Batman to the Legion of Super-Pets – has gathered to honor Superman. And that’s a problem, because Clark Kent is expected, and how is Superman going to pull that off? Gee, Lori, maybe because they don’t want their thoughts read by a nosy telepathic mermaid? How often did Superman use his powers to spy on women anyway? Privacy is a fascinating concept to consider when reading Silver Age comics: Nobody has any. Superman uses his super-hearing to eavesdrop on the women. Lois “borrowed” a device from Professor Potter that acts like a Geiger counter around electronic devices. If a robot replaces Superman, they’ll know it. 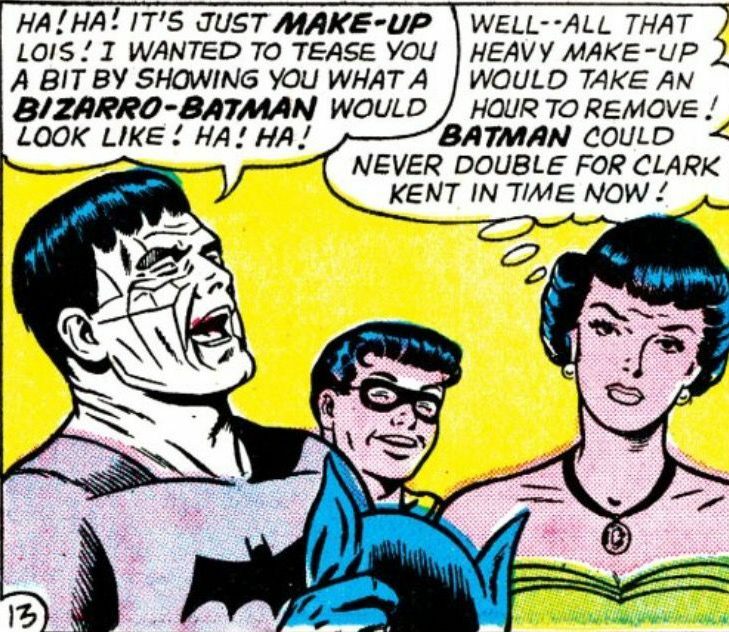 Batman decides to provoke Lois and her long-running interest in both their secret identities by unmasking – and revealing a Bizarro-Batman. Bizarro say Batman one good guy. The facial expressions in this panel are priceless. Batman looks downright unhinged. Lois looks as if she’s ready to give up on men forever and run off with Lana. Then the impossible happens: Clark joins the party. 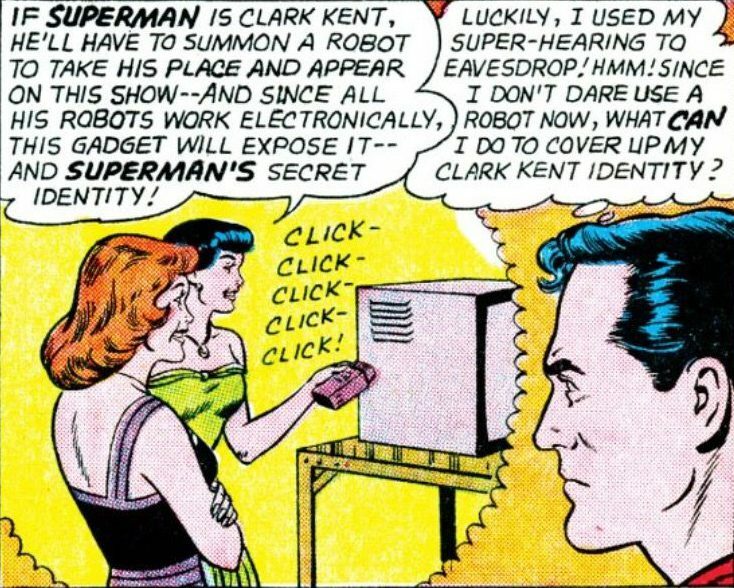 Lois and Lana are crushed when their device does not detect a robot. That must mean their theory that Clark and Superman are one and the same must be wrong. John F. Kennedy and Superman: Super-Friends, for a brief moment. 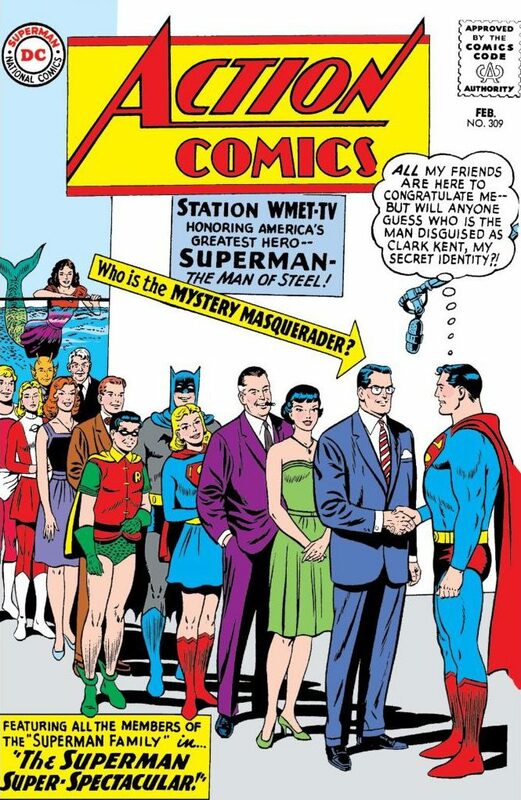 These bright women apparently can’t fathom the idea that Supes might be acquainted with someone outside their circle who could slap on a mask and some glasses and pass for his nebbishy alter ego. And what a reveal that is: President John F. Kennedy. It’s always a surprise when a real-life figure pops up in a comic book, and so dramatically to boot. 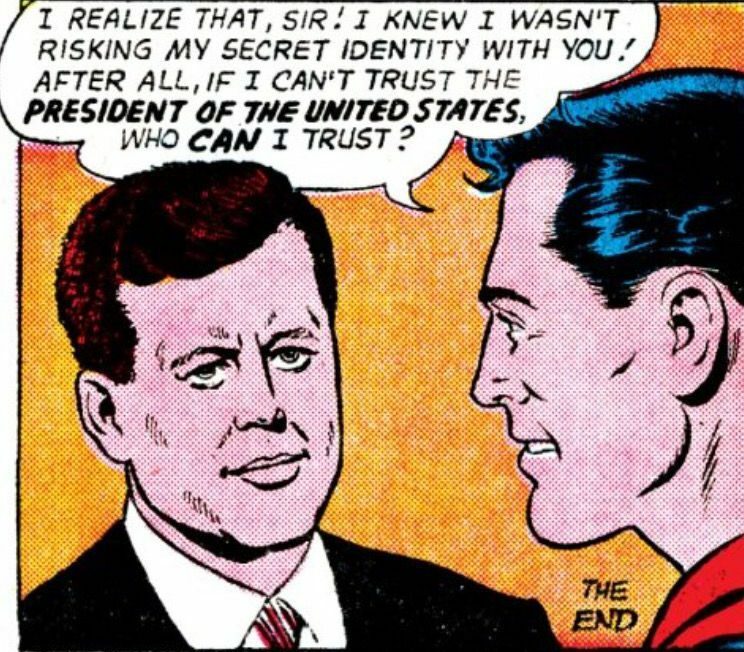 “I’ll guard your secret identity as I guard the secrets of our nation,” Kennedy tells Superman. So why is this story so heart-wrenching? It has little to do with the story and everything to do with the timing. The cover date for “Action Comics” No. 309? February 1964. Given how comics were dated about three months later than their actual release date to ensure a longer shelf life on newsstands, that means that this issue reached millions of readers just days after Kennedy’s assassination in Dallas on Nov. 22, 1963. Youngsters looking for escape must have been devastated by the reveal. Here was a reminder of how much the country had lost, a good, decent man with integrity. A story like this could never be told today. The current president would label Superman an illegal immigrant. If Superman was stupid enough to entrust his secret identity to him, he would immediately blab it to any Russian diplomat in the vicinity – as he did with Israeli intelligence – just to impress impress Russian despot Vladimir Putin. The tale stands today as a sample of the best of the Silver Age, a capsule of charm and innocence, a reminder of a time when we trusted our elected officials, when we had elected officials worthy of our trust. Great post! Curt Swan was such a great artist. He really was, Keith, and I have to say it wasn’t until the Showcase Superman editions that I realized how much I had been missing.